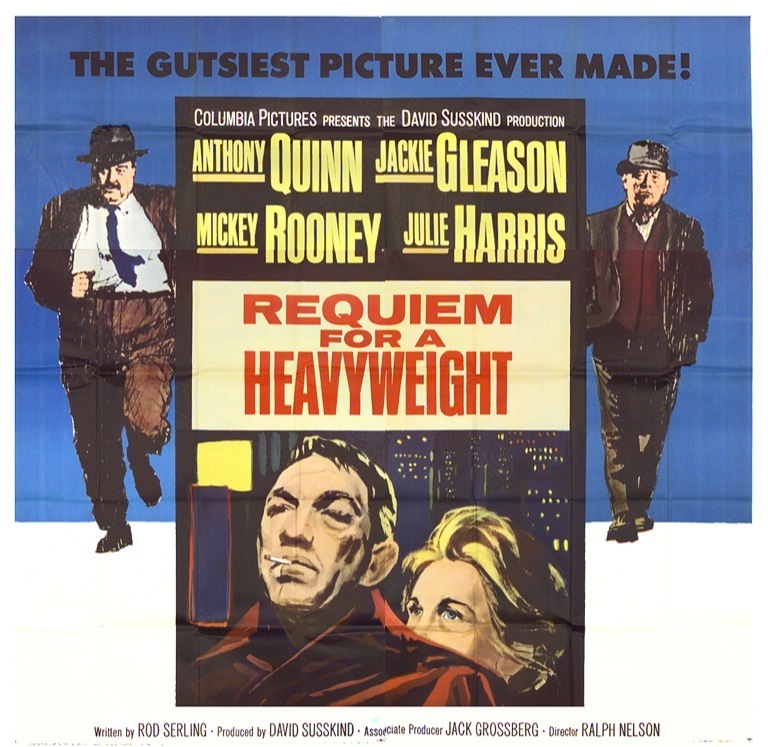 In its visual style and heady narrative, Requiem for a Heavyweight (1962) resembles few other films of its genre and ranks among the greatest boxing movies of all time. 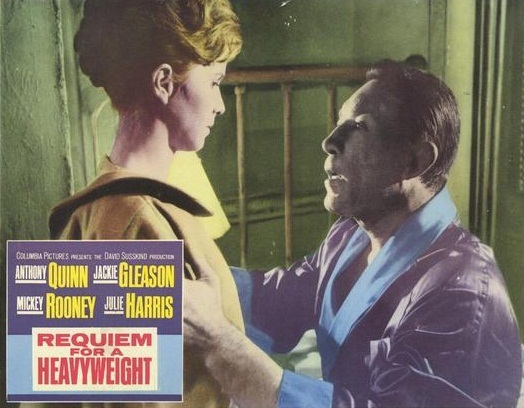 Nominally a film noir yet subverting the genre’s conventions, in just eighty-six minutes it furthers investigation into the meaning of suffering plumbed in ancient Greek tragedy, offering a grim vision of human nature as relevant in the fifth century B.C. as it was in 1962 and still is today. 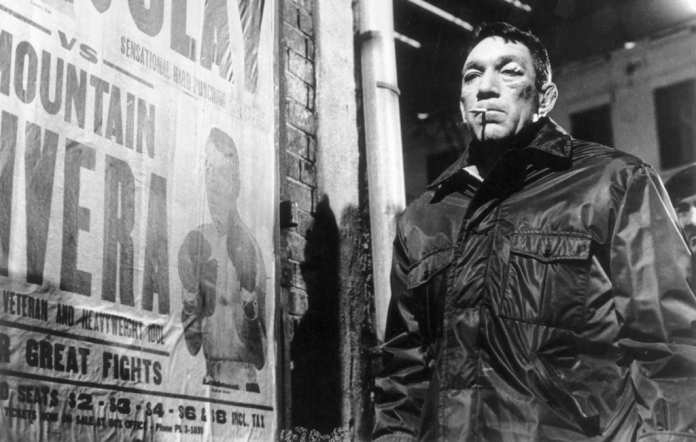 No other film about professional boxing seems to hate the “sport” so much, while eulogizing one of its doomed competitors for his ability to endure the raw deal that seals his fate. The Prizefighter, then, is examined for his suffering and its significance, a link perceived as far back as Greek antiquity. 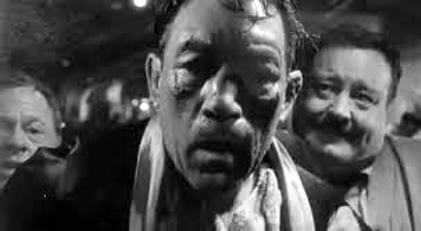 Whereas the Oresteia of Aeschylus envisions the progress borne of suffering producing the great achievements of civilization, Requiem for a Heavyweight questions the value of Mountain’s existence where pleasure is rare and pain is the norm. As the film ends his life may, or may not, be worth living. Our hapless Mountain is a husky-voiced and bruised bear with a grade six education and a huge store of love and loyalty, especially for Maish, his father-figure. Mountain knows himself, holding no illusion about the limits of his personal handicaps and achievements: “I got no special problems. I’m a big, ugly slob, and I look like a freak. But I was almost heavyweight champion of the world.” In fact, he was ranked number five in 1952, a year, he adds, filled with champions like Rocky Marciano and Archie Moore. The wise old men of the Oresteia tell of Zeus who “lays it down as law/ that we must suffer, suffer into truth,” thus advancing as individuals and as a society. Yet even though Mountain grows wise to his fated subjection to the treachery of men, the truth brings him no advancement. 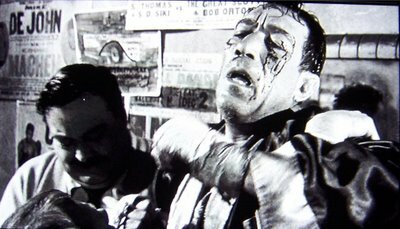 The final scene, in which he chooses to go on being exploited and humiliated, gives his pain a purpose of heartrending ambiguity. Maish, too, while a self-centred schemer, earns sympathy in how much he loves his “son.” When Mountain apologizes for losing and letting him down, Maish’s eyes well up and he really wants to mean it when he says, “As far as I’m concerned, you were number one.” But all along Maish knew that Mountain would lose to a younger, faster Clay, betting a thousand dollars he’d get knocked out by the fourth round, plus another thousand belonging to mob boss Ma Greeny. Mountain lasts until the seventh and now Maish has a week to pay Ma back, with interest, or die. 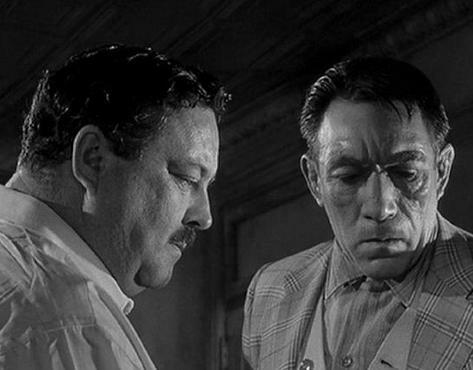 Screen legends Jackie Gleason and Anthony Quinn. To raise the money he forces Mountain to perform staged wrestling matches and when Army berates him for making a fool out of Mountain, Maish snaps, “So I’m sellin’ his soul on the street! He owes me. I figure it’s as simple as that.” Maish knows he’s lying though, guilt beading sweat on his brow as he pounds his chest. He doesn’t want to ruin Mountain but the mob is promising to kill Maish and survival justifies disgrace, disloyalty and betrayal.